Click above to enter our very own on line shop! Find everything you need to get started dancing! Items will be shipped directly to you. If you are not sure what sizes your child needs, stop in! We have sizing leotards and shoes for your child to try on so you can rest assured that everything will fit! Garnet/ Amethyst/Emerald/Diamond level ballerinas need to wear a black leotard and pink tights for ballet, pointe, and pre pointe classes. Your preschool ruby will need to wear a leotard that makes them feel beautiful (girls) or shorts and a t-shirt that makes them feel confident (boys). Any color and style that makes them know they are special and that the class is especially for them is recommended. Their hair should be pulled away from their faces so we can watch their amazing smiles as they enjoy their journey through class! Your preschool sapphires should feel special when they come to dance class! Because this is such a special time for them, they should wear a leotard that makes them realize how beautiful they are(girls) or shorts and a t-shirt that makes them realize how important they are(boys). Tap shoes are necessary (black) and ballet slippers (pink, girls), or jazz shoes (black, boys). Because we want to see their faces sparkle when they dance, they will need their hair pulled away from their face. Click here to register for 2019 Classes! Find exactly what your child needs for day one! Not sure on sizes? Come on in to the studio and we can size him/her before you order! Black tap shoes, shiny or matte finish. 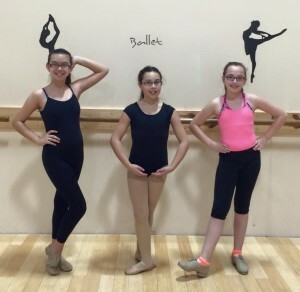 Girls– leotards (any color, with or without a skirt) Tights should be worn in the colder months. May add shorts or leggings (no long pants or sweats) Boys– t-shirt and shorts. If students are not wearing tights, they need to wear socks in order to prevent blisters. Girls– tan tap shoes, slip on, tie up or Mary Jane style, leotard, camisole top, or tank, dance shorts or leggings (no long pants or sweats) Boys– black tap shoes, shorts and t-shirt. Pink split sole or full sole ballet slippers, leotard (any color, with or without a skirt) hair should be pulled into a pony tail or bun. Dance shorts or leggings may be worn over leotard. Tights should be worn in the colder months. Pink split sole canvas ballet slippers, black leotard, pink tights. Hair should be in a bun. Click here and enter our on line dancewear store! Order exactly what you need by class! We can even help you size correctly at the studio, before you buy! Black jazz shoes, leotard (any style or color, with or without a skirt), shorts or leggings may be worn over leotard. Tights should be worn In colder weather. Hair should be pulled back into a pony tail or bun. Tan jazz shoes, leotard (any color), dance shorts or leggings, a camisole top may be worn over leotard. Tights should be worn in colder weather. Hair should be pulled back in a pony tail or bun. White Chuck Taylor Style canvas low tops, or hip hop shoes ordered through us, leotard or t shirt, dance shorts or capris, sweats, or any pants you can move in. No jeans. Click here to find exactly what you need to buy for class! Our new online store makes it easy to know exactly what you need! Shop by level and/or class! Leggings, camisole or tank (or leotard), modern shoes. Comfortable clothing, black shoes for tap and jazz, pink canvas ballet slippers for ballet.